Prince Edward Island mussels, fall harvest salad, oyster stew, venison short loin and pan seared Atlantic salmon. Hungry yet? These are just five of the many small plates now available at the Milton Inn. This a relatively new menu concept developed by owner chef Brian Boston. He determined many people don’t necessarily want to order large portions at lunch or dinner. Eating a full-scale meal on occasion might be OK, but there is no doubt many nights, especially in the warmer months, that smaller portions are just fine. Hence his creation of the one, two or three course Small Plates, available in the 1740 Lounge. I was there the night some members of the media were feasted with a sampling of the various items on the menu. All that I mentioned above are just fine thank you, but I also enjoyed the seafood martini (jumbo shrimp, colossal crab, lobster claw), the warm wilted winter salad (field greens, mustard greens, bosc pear, chevre cheese) and the beef tenderloin tartare (anchovy aioli, sriracha, capers, comichons,quail egg yolk). OK, so I didn’t know what sriracha and comichons were, but I figured if Brian Boston put them on his menu they have to be good. These items are available every day and are worth investigating. Personally, I can recall on a number on occasions walking into a restaurant and wanting to order something on the light side, but not finding anything. With a menu like this, with nearly 30 selections, you are certainly going to find many items to your liking. With smaller portions you can experiment with a few of them. For 1 course the price is $12.00, two courses $24.00 and three courses $36.00. Another advantage of the Small Plates is the opportunity to dine in one of the outstanding restaurants in our area. It has been around since 1740 (the name of the lounge) and has its share of history. You can’t imagine the number of famous people, both past and present, who have dined here. If all the dining areas are open you can ask to sit in your favorite location. This time of year I suggest you ask for a room with a fireplace. How cozy, warm and quaint. It certainly calls for a romantic evening. If you’re dining with your boss, ask for one of the front rooms. One way to determine the popularity of a restaurant is by the length of its existence. Another way is word of mouth. 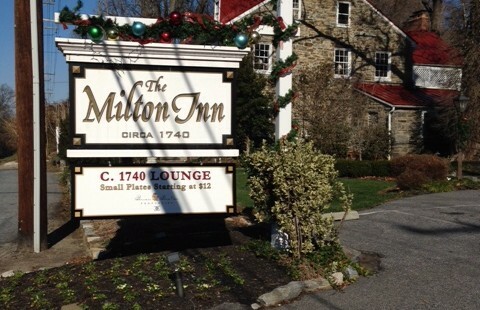 The Milton Inn scores an A on both accounts. My first experience here was having dinner before my prom which was back in 1938. No it wasn’t. Come on, ot was 50 years ago. I recall how important I thought I was and how impressed my date must be. That was our last date. But believe me it wasn’t the fault of the Milton Inn. It might have had something to do with the fact I flirted with her best friend for half the night. thought I was and how impressed my fiancé must be. That was the night my soon-to-be father-in-law left the house without his wallet and my soon to be mother-in-law had $3. Showing the class this restaurant has exhibited over these oh so many years, they actually let us leave with the promise somebody would return the next day. What does all this have to do with the small plates? Absolutely nothing. I just couldn’t think of a better place to tell those stories than in an article about that very restaurant. Anyway, I have already been back once, and to be honest, didn’t experiment. I knew what I liked and ordered it again. Hey, experimenting isn’t required. So do yourself a favor and stop by The Milton Inn soon. It’s at 14833 York Road, Sparks. Reservations are always a very good idea (410-771-4366). Don’t embarrass yourself by wearing jeans. Look through that wardrobe guys and find something nice. You ladies, I don’t have to worry about. First of all, what a treat it is to spend any time at all in south Florida during the winter.